I knew Manute Bol only as the gangly 7 foot 7 shot blocker for the Washington Bullets. I was saddened to learn of his recent death at the age of 47, but fascinated to learn of his life outside of basketball. A member of the Dinka tribe and the descendant of chiefs, Bol once killed a lion with a spear while herding cows. "There’s no way I can put the money in my pocket while my people are getting beat up,” Bol once said. “Whatever I can do to help my people I will do. I feel whatever I make here I make for my people. His own family was killed by Darfurians during the Sudanese civil war, yet his was one the first and most vocal voices on behalf of Darfur when Arab Muslims began their ethnic cleansing in the region. He always said extremists were the enemy, not Muslims. In an effort to get NATO to help, he met with 40 Congressman and people at the Pentagon to get help against the slaughter, arguing that UN efforts were failing and the African Union was too weak to do anything. Then he did everything he could in Sudan itself. 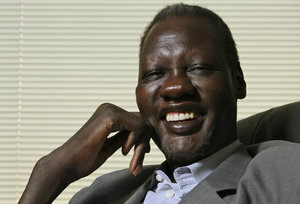 During his playing career, Bol went into war zones to help the Lost Boys and other refugees. Sometimes, those visits were interrupted by bombings from warlords who viewed Bol as a threat. He was once promised a Sudanese cabinet post but refused once he found out he would be required to convert to Islam. He then couldn’t leave the country for nearly five years. While in Sudan he contracted Stevens-Johnson Syndrome, a painful disease that causes among other things the loss of patches of skin. That contributed to his death. Bol was hospitalized in mid-May during a stopover in Washington after returning to the United States from Sudan, where Bol was helping build a school in conjunction with Sudan Sunrise. Bol had stayed in Sudan a week longer than anticipated after the president of southern Sudan asked Bol to make election appearances to help counter corruption. Prichard said that Bol knew he needed medical care but put it off because the president asked him to stay. “There’s no question Manute gave his life for his country,” Prichard said, adding that Bol said in the hospital “I did it” in having the election turn out the right way. Jon Shields has a nice piece in this morning's WSJ about Manute Bol, and here's more from Pamela Geller, who knew him.